A Case Study examining a successful Chem E-Car Team’s at work. Next Event: Monday, October 17th Dinner Venue. Topic: Project Management - A Case Study examining a successful Chem-E-Car Team’s activities at work. Speakers: Yejoon Seo, Vice President of AIChE CCNY Student Chapter, and Riliwan Sanni, Chem-E-Car team member. Yejoon Seo is a Senior and the Vice President of the AIChE student chapter at the City College of New York. Yejoon is an active research assistant in the field of polymer engineering, and has previous experience working at Pfizer as a summer intern at Pearl River, NY. He hopes to benefit professionally from the monthly Metro NY AIChE meetings and the Student National Conference at San Francisco in November. He plans to enter the pharmaceutical industry after graduation. Riliwan Sanni is a Senior undergraduate chemical engineering student and member of the Chem-E-Car team at the City College of New York. He is also am active student researcher in soft materials. Riliwan plans to get an advanced degree after graduation, and sees the AIChE Annual Student Conference in San Francisco as an opportunity to network with graduate schools. Abstract: The CCNY (City College of New York) Chem-E-Car team will be the presenters at our October meeting. They were very successful at the Mid-Atlantic regional competition this past spring and are preparing for the National Chem-E-Car competition in November. Background: Chem-E-Car is an annual college competition for students majoring in Chemical Engineering. Student teams must design small-scale automobiles that operate by chemical means, along with a poster describing their research. Details. This year’s final will be a highlight of the Annual Student Conference at the AIChE’s Annual Meeting (in San Francisco, November 13-18). 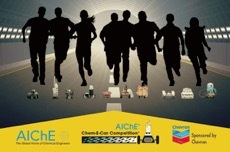 Over 30 student teams from around the world will be racing their chemically powered vehicles on Sunday, November 13th, 12:30 pm-3:30 pm Pacific Time. The Chem-E-Car Competition is sponsored by Chevron. CCNY’s Iodonator C-8 Team was one of the five regional winners at the Mid-Atlantic competition, which also included teams from Stony Brook University, NJIT, Carnegie Mellon, and Virginia Tech, also advancing to the National event in SF. Topic: Project Management - A Case Study examining a successful Chem E-Car Team’s at work. Topic: Engineering, Design & Construction in the 21st Century. Although the exact date has yet to be confirmed (tentatively Monday, 11/21), we are honored to have Nathiel Egosi, P.E., President and CEO of RRT Design & Construction as our November speaker. RRT Design & Construction (Melville, NY) is a national leader in the engineering and construction of solid-waste processing and recycling facilities.